In 2013, Colorado’s Department of Human Services (CDHS), Division of Child Welfare (DCW) was chosen as one of eighteen grantees to receive a planning grant (Phase I) from the U.S. Department of Health and Human Services’ Children’s Bureau under their Youth-At-Risk-of-Homelessness (YARH) demonstration projects. Since then, Colorado was selected as one of six grantee sites to move on to Phase II, to implement and conduct a formative evaluation of the model intervention conceived in Phase I. The purpose of YARH is to develop, implement, and test a model intervention that prevents and addresses homelessness among youth with current or prior foster care involvement. 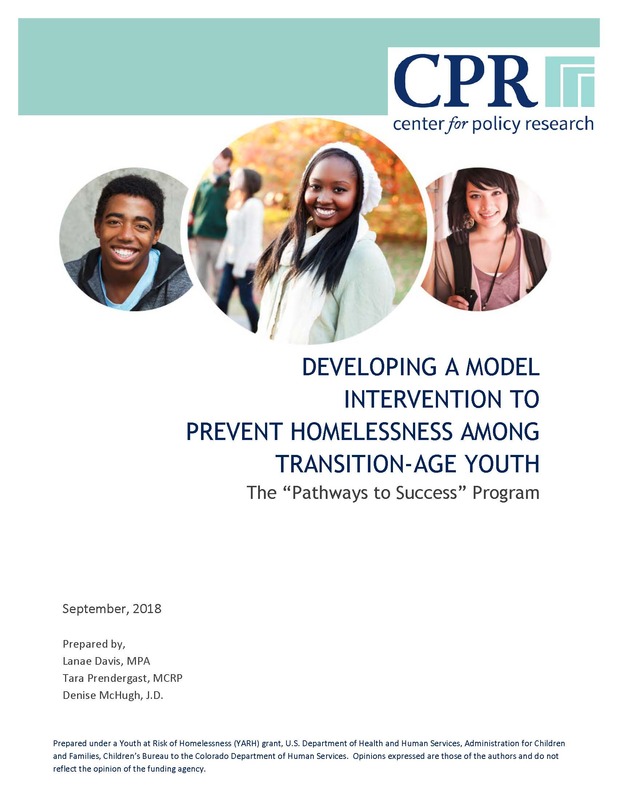 Ultimately, the goal of the YARH demonstration projects is to produce evidence-based interventions that other child welfare agencies can implement in their jurisdictions in an effort to prevent youth with foster care involvement from becoming homeless. The first in a series, this research brief describes Colorado’s Pathways to Success model. It reviews how the model was developed and highlights lessons learned from the planning and implementation of the model intervention. The brief concludes with a list of key considerations and lessons learned that other state or local jurisdictions should consider when developing new interventions to address the needs of transition-age youth.